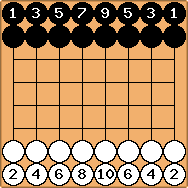 As a strategy game, Go is often compared to international chess, a comparison which is controversial among Go players. The rest of this page describes international chess. Since Sensei's focus is Go, this entry is rather short. Please follow the links given below if you are looking for more information about chess. The aim of the game is to checkmate the enemy king (unescapeable capture threat). The Chess Programming Wiki which also contains a lot of information about Computer Go. Charles: On the other hand it is argued here at Compare Go To Chess that this is a bad habit. Which will indeed not stop it happening. There is a gap between the idea that chess players may well find go interesting (true), and that they are ready to become converts to go if given a few paragraphs of information about it by some go player keen to proselytise (which is definitely not true). This has the consequence that any comparisons made need to be made with great sensitivity, since crude advertising of go's undoubted merits will be counter-productive. For example, there may not be a chess wiki but that implies nothing, does it? RussellKhan: Sometimes it feels like I'm one of the only Go players who still plays and enjoys chess. Since I'm sure this is not the case, I think it's time to start a page for Go Players Who Also Play Chess. TimBrent: A slight correction for the person who stated both began in China: Chess, as Chaturanga, began around 600 AD in India?, and spread both East (as xiangqi and shogi) and West (as Shatranj and Chess). I do believe the xiangqi method of moving (on the points not the squares) is influenced by Weiqi. Mark Wirdnam: This claim about the origin of Chess is the most common one, but according to the people actually putting time and effort into historical research of the matter, it's not as simple as that. A good starting point for reading about the existing evidence and theories concerning the origin of Chess: http://www.mynetcologne.de/~nc-jostenge/. I was somewhat surprised that historians claimed xiangqi began as late as 600 AD. So I googled and as I expected, there are ancient Chinese literature which stated there was a board game named 'xiangqi'. For example, the artical is a brief history of xiangqi http://member.netease.com/~gbc/xqqy.htm. 'old-xiangqi' seemed to evolve in China for hundreds (perhaps more than one thousand) of years and around Tang Dynasty (around 700 AD) it has basically the same form as xiangqi today. First of all, this old board game, whatever it was, was NOT Go. The characters for the names of these two games are different and it's impossible to make such a mistake for any Chinese historian. Confucius called Go 'Yi', Mengzi also called Go 'Yi', but Sung Yu called this old board game 'xiangqi'. Whether this old board game is the ancestor of all chess-like games should be left to historians and thoese who are interested to read dozens of google pages. At least one thing is certain that xiangqi was not imported from India provided Chaturanga began as late as around 600 AD. To answer the above question: Actually the article cited an old literature 'Shiu Zang Qin' which said in mid Tang Dynasty a minister added the 'cannon' to xiangqi. I am not sure of the exact year but it's AD not BC. Also there are many other articles and I am not sure which one is supposed to be an academic research. Nevertheless, the point here is that there were several authors who lived before 600 AD(even before Christ, for example Sung Yu and Liu Xiang) mentioned there was a board game called 'xiangqi'. And we can trace back the literature to say that how (perhaps with some speculation) the 'xiangqi' evoled into the form we know today. As far as I read, there are no old Chinese literature which connected this game to India. Perhaps the only possibility is that 'xiang' means elephant, which is considered to be a kind of animal from India by many Chinese. However, since the literature Chu Chi and Shou Yun (both before Christ) already used the term 'xiang', I think the reasonable explanation is 'xiang' does not mean 'elephant'. The Chinese 'xiang' means 'image' (roughly) in many cases. Notably Chaturanga was supposed to be just born around 600 AD, so this game should not be very popular in India around 600 AD. However, the existence of old literature such as Xiang Qin, Xiang Qi Qin Fu,etc,proved that xiangqi was well-known in China then. The theory that xiangqi came from India later than 600 AD, but became a well-known game earlier than 600 AD in China, and there were no Chinese literature which related it to India, a country which was well-known to Chinese authors as the homeland of Buddha, is not reasonable to me. I am not historian and it's impossible for me to dig into all the old literatures, but I have never heard of anyone who plays xiangqi and thinks xiangqi came from India. HolIgor: I don't know much about the history of chess in China and India, but Confucius lived 600 years before Christ. It is a mystery, though, why would they invent xiangqi if they had weiqi. I don't think Confucius liked weiqi. When he talked about weiqi, he said "Even those gamblers or weiqi players are better than those who idle all day long.". Confucius didn't like anything or any activity that could be called "addictive" "of sensual pleasure" such as gambling, music of Cheng, and unfortuately playing weiqi. But he said in another chapter of his analects:"Even an unimportant thing has its own merit, but a gentleman should not invest too much time on it. Otherwise, he probably will get addicted." So, perhaps it so happened that once he tried to play some games of weiqi but lost them all. Just joking. In November, 2001, a piece of xiangqi 'chariot' was dug up. The diameter of this piece is 2.9 cm and the thickness of 1.3 cm. The date when the piece was made is no late than 25 ~ 220 AD http://www.chnmus.net/information/C-news/c2001-11.htm. The charcater on this piece is already 'chariot'. That means, any game with a 'chariot' which influenced the development of xiangqi has to arrive in China no later than 220 AD, and probably at a much earlier time, when even Buddha had not yet made his way to China. First saw it in a chess introduction by Laszló Orbán (ISBN 3-581-66085-7), explaining the seemingly odd Knight movement ( ). It shows how pieces originally moved, each starting from the center. Bishop and Rook actually didn't move but jumped, and were rather weak. The Knight, covering the rest, was the strongest piece. Much of this still can be found in Chinese chess (xiangqi), by the way. Chilitasha: Some thoughts and comments. Joseph Needham believed in the Chinese origin of chess. Weiqi, its variants in Tibet, Korea and Japan, as well as derivatives such as the various regional forms of Fangqi (方棋 Square Game) plays and moves stones on the intersections and along the lines. Line represents the path or road that a human soldier takes. A square represents a well (井) or field (that uses to grow corps) (田). We know the use of term Xiangqi 象棋 and Xiangxi 象戲 date back to almost 2000 years old. In addition to meaning the animal elephant, a more common meaning of Xiang 象 in Classical Chinese is "Representation", i.e. representation of celestial movement. The often quoted Xiangqi invented by Emperor Wudi of Northern Zhou Dynasty in 569 CE is believed to be evolved from the Han Dynasty game Sai (塞), which in turned evolved from Bo(博). These games are believed to be played with by throwing wooded pieces which act as dice. The Tang Dynasty Xiangqi plays on a 8 x 8 board marked with Yin and Yang colors, i.e. Black and White, and the Xiangqi pieces were little statues, similar to modern Mongolian Chess. There are more than a dozen variants of Xiangqi recorded in history during the Tang and Northern Song Dynasties, including 9 x 9 version with piece names similar to Shoji. The current Xiangqi form is quite certain standardized in Northern Song period. Xiangqi pieces have also been used in card game throughout history, and still remains a popular form in Taiwan. The Song Dynasty game Da Ma (打馬) used modern Xiangqi board, however it was believed to be the earlier form of Mahjong.